You might ask yourself if it’s really that practical to buy a video projector when television screens today are ever-expanding. It’s not even hard to find a high-quality 65-inch TV at a very reasonable price these days. However, if you are looking for a truly cinematic experience, a projector is what you need. A video projector can give you a screen that can easily reach beyond 120 inches and most projectors now support 4K UHD resolution and cover breathtaking wide color gamuts, just like their 4K TV equivalents. Just bear in mind that projectors are somehow a bit more complicated than TVs and will need a small amount of extra work and consideration. But if you do decide to buy one, it is for sure that it will bring your home theater to life. So should you buy one? Here are some of the things you should take note of before you buy your own projector. First things first before buying a video projector is to consider your room lighting. Before, it was a problem that to have a well-established projector brightness because it will require you to have an absolutely dark room. But thanks to our improving and better technology, projectors today are brighter and affordable that it can handle moderate ambient light or even well-lit rooms. You can even find mini projectors in the market today that can also provide the same quality of a regular projector. But if you have a darker room then it’s good for you! For the picture quality to have a great contrast, a projector normally needs darkness to make an image that looks bold and strong, not washed out. 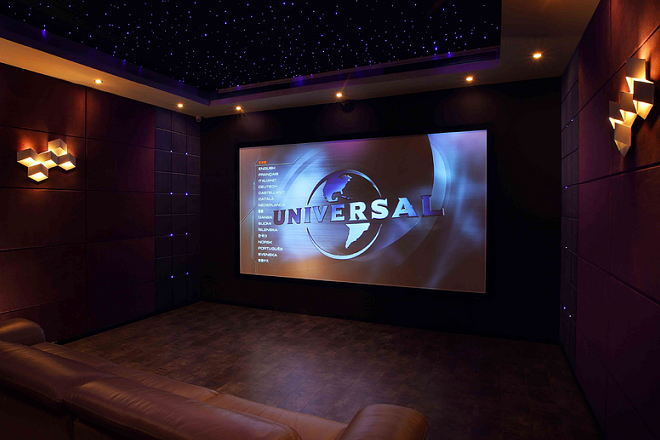 It is a popular thing to have projectors placed in basements because they tend to be dark by nature but if you don’t have a basement then no need to worry because as long as you can block out that light from your windows with curtains or put up blackout curtains or shades, any room can work a projector. After making sure that you have enough dark room, you need space and a larger one. But if it’s not possible, you can mount a manual or motorized drop-down screen from your ceiling. Another option is to mount a fixed screen to your wall if you’re willing to sacrifice the space. You can also paint your wall with a special projection-screen paint. Think of where to correctly place your speakers and furniture and make sure you have enough space for the screen. Now that you have a space for a screen in your mind, you have to think about two distances: throw distance – the distance between the video projector and screen – and viewing distance – how far it is from your seat to the screen. If you are not updated, there are now “short throw” projectors that will provide you with the same size image from as little as three and a half feet away compared to many projectors that require at least 10 feet, but there are more expensive. Usually, experts suggest that you sit 10 feet from a 110-inch screen. You can measure that with the use of throw distance calculator online for you to identify if you have enough space for the projector you are considering. There are online calculators for this to determine the viewing distance of how far you should sit from an image of a certain size. We have already mentioned above the factors that can affect the screen, but you also importantly need to consider the projector itself. You have to be able to place the projector at the best possible distance and angle from the TV. The best image quality will come from a centered projector. Make sure that the center of the projector’s lens should align with the horizontal center of your screen. But if you can’t do that, you can opt for projectors with lens-shift features. This will allow you to adjust the placing of the projector a little off to the left or right. Also, you might want that you can clearly run at least one HDMI cable and power to this installation location. You can try to sit the projector on a table or in a cabinet so that the wires run along either the inside or outside of the wall and ceiling. Lastly, this is just an important suggestion to any home theater. Since projectors only have fewer connection ports than TVs, having an A/V receiver is a natural fit for projector setups. Mostly all projectors have only one HDMI input, you will need an A/V receiver to connect multiple devices. An HDMI switcher is an option, but an A/V receiver is better. You will have sound to your speaker system and since projectors have very weak speakers. We hope you have gone through this guide and you can determine if you should buy one for your home. If you decide to buy a home projector, then I am sure you are excited to have that ideal cinematic experience that you and you family would enjoy! Ivandrea Ollero is a daytime writer for Zapals, an international online shopping powerhouse for global shoppers that provides vast high quality products at the lowest prices. Ivandrea gives tips for a seamless shopping experience and information on the latest gadgets.